Delve into the inner workings of Rome's famed Colosseum on an exclusive skip-the-line access visit to this largest amphitheater ever built. 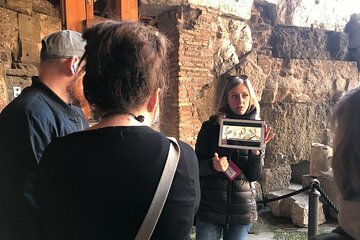 Head into the Colosseum's lower dungeons—typically off-limits—and see where gladiators awaited their turn in front of the crowds. Imagine what must have been going through the minds of these prized fighters while your guide regales you with fascinating facts and stories. Then ascend to the building's Third Tier for a whole new Colosseum perspective. Afterward, spend time exploring the nearby Roman Forum, the ancient city's social and political hub. This was my 2nd time at the colosseum, Palentine hill, and the forum ruins (first time in restricted access areas). I've done many tours and each tour guide has their own take on the historical stories. Our guide Francesca is also an archeologist, I really enjoyed her insights and discussions on what used to be. I learned things I didn't learn before. She gave us time to feel what it must have been like to enter the arena as a gladiator. I highly recommend this tour. Really great tour. It is a long tour, both on distance and time. Well covered Colosseum and Forum. Very knowledgeable guide and small group make it well worth the money.